The COS Theatre program is dedicated to the advancement of the theatre arts, through traditional study and performance, and to the development of new theatrical ventures. We prepare students for further study and for an ever-changing profession. Is our fate predestined and if we knew our fate in advance, would we/could we change it? 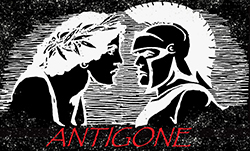 Antigone by Sophocles, the ancient great 'resistance' drama, continues to be relevant even in our modern times. It challenges us to question the position of the individual within the society, the fairness of society’s laws and what happens when the individual rises up against those laws that they deem unjust. This classic tragedy also highlights the empowerment of women, loyalty and love. The Theatre Department at COS and Director Neil Carpentier-Alting are planning a unique presentation of the classic play exploring the boundaries of morality and duty for young people in every generation. Performances are scheduled April 5, 6, 12, 13 at 7:00 pm and April 7, 14 at 3:00 pm at the Kenneth Ford Theatre on the COS Weed Campus. Tickets will be available at the COS Bookstore.